This blog post examines the different components of the blockchain technology ecosystem. We will illustrate what the categories of innovation are and which categories have the most companies. We will also compare the categories in terms of their funding and maturity. Let’s start off by looking at the Sector Map. We have classified 1094 blockchain technology startups into 12 categories that have raised $10 billion. The Sector Map highlights the number of companies in each category. It also shows a random sampling of companies in each category. We see that Blockchain Innovations is the largest category with 312 companies. These companies are working on distributed ledger technologies, such as smart self-enforcing contracts, cross-blockchain interoperability, and increased transaction speeds. Some example companies in this category include Blockstream, Filecoin, Blockstack, and Ripple. Our Innovation Quadrant divides the blockchain technology categories into four different quadrants. 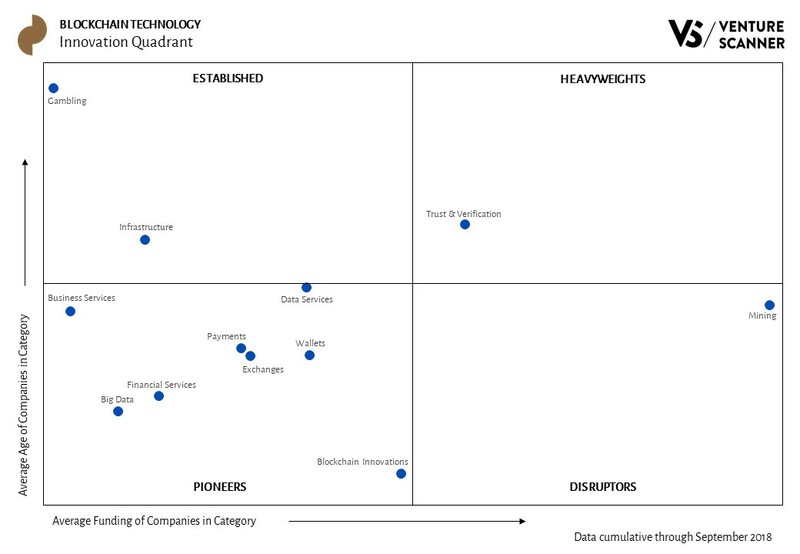 We see that the Pioneers quadrant has the most blockchain technology categories with 8. These categories are in the earlier stages of funding and maturity. The Established quadrant has 2 categories that have reached maturity with less-than-average financing. The Disruptors quadrant contains one category, Mining. This category has acquired significant financing at a young age. The Heavyweights quadrant also has one category, Trust and Verification. This category has reached maturity with significant financing. We’ve analyzed the blockchain technology categories and their relative stages of innovation. Let’s now look at how they stack up against one another in terms of their total funding versus company counts. 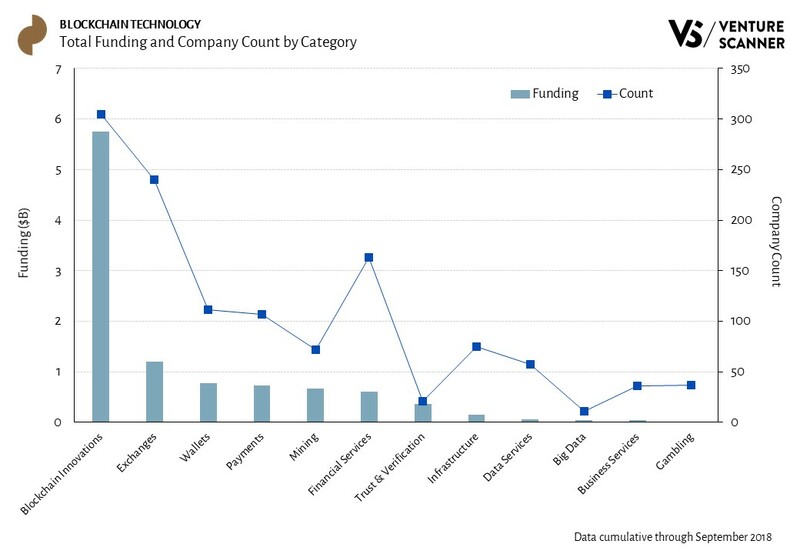 As the above graphic implies, the Blockchain Innovations category dominates the sector in total funding with $5.7B. Its funding is almost 5 times the funding of the next category, Exchanges with $1.2B. As the analysis above demonstrates, Blockchain Innovations leads in total companies and funding. We’ll see how the blockchain technology landscape evolves and develops in the new year! 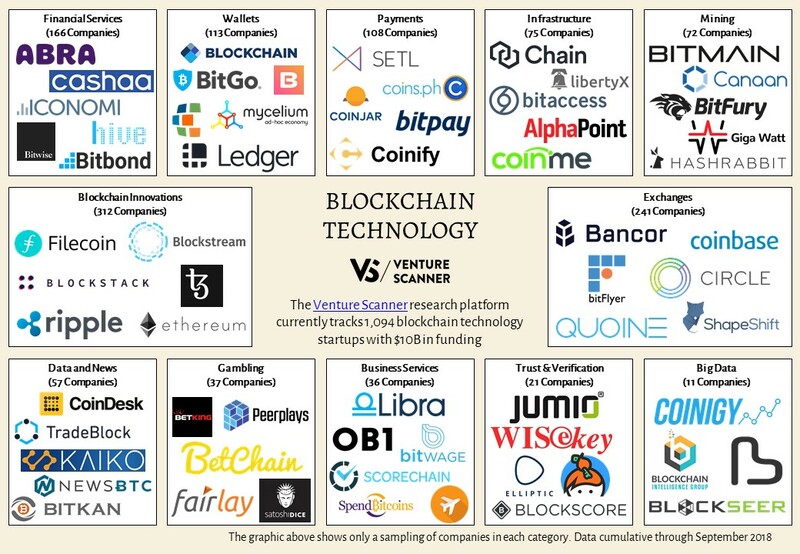 To learn more about our complete blockchain technology report and research platform, visit us at www.venturescanner.com or contact us at info@venturescanner.com.